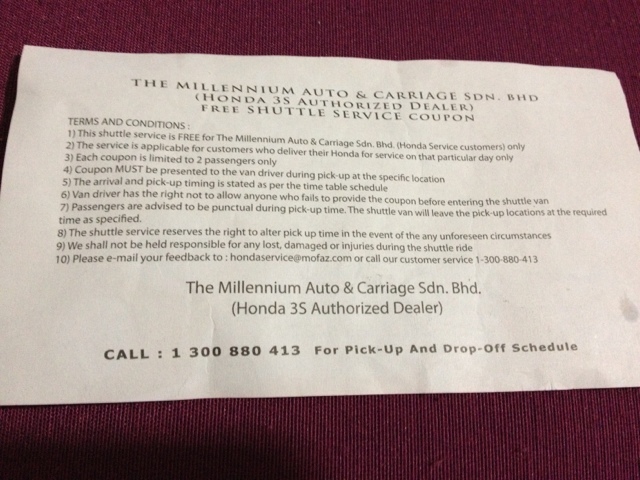 After a few years of visiting Honda Millenium Damansara, I have seen its service evolve for the better. 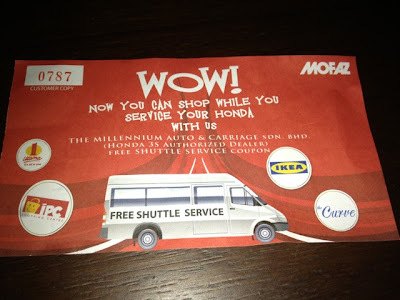 I'm truly impressed with their shuttle service to the nearby shopping malls (The Curve and One Utama) while they work on your car. I have taken the shuttle service twice. It was prompt, polite and reliable. Makes your visit to the car service less... Well, less boring and time will pass by quickly. One of the reasons why we ended buying a car from that brand and that branch is exactly because of the kind of service they give. Keep up the good work at Honda Millenium! I'm sure many customer out there appreciate it. Posted a picture of the coupon they give for the drop off and pick up service. I have read some cool stuff here. So thanks for this sharing.